In the early 1940’s, Dr Frederick Mohs, Professor of Surgery at the University of Wisconsin, developed this advanced surgical treatment for skin cancer. Mohs surgery is highly specialised treatment for the total removal of skin cancers. Mohs surgery is a subspeciality of Dermatology and your dermatologist has done further training registered with the Australian College of Dermatologists. Mohs surgery is most commonly used to treat basal cell carcinomas and intraepithelial carcinomas or squamous cell carcinomas. It may also be used to treat a variety of rare tumours. When a BCC or SCC is excised with other surgery, it is removed with a margin of 3-4mm around the tumour. This removes the tumour completely in 95% of cases; however, in 5% of cases, pathology analysis may confirm the tumour to be present at the edge of the specimen. This means that the cancer has not been fully removed, and necessitates further surgery, with re-excision of the scar at a later date. Mohs surgery, by contrast, is all done on the day, including the pathology. Your basal cell carcinoma is marked out, and excised with a margin of approximately 1mm. This is performed under local anaesthetic. A long-acting anaesthetic is used, to ensure you are comfortable throughout the day. After the excision, a dressing applied to the open wound, and you return to the waiting area. This initial stage takes 10-15 minutes. This tissue is then divided into several portions, with each section marked and inked. A surgical map is drawn, with each section numbered, to maintain orientation. The tissue is then frozen, and a technician makes microscope slides of the tumour’s margins. The horizontal sectioning technique allows visualisation of more than 99% of the tumour’s margins, compared to less than 1% seen in normal pathology sections. These microscope slides are then reviewed by your Mohs surgeon, and you are brought back in to the operating theatre. If the slides are clear, then your surgical defect can be repaired (see surgical repair below). If tumour is present at the edge, then your Mohs surgeon will take a further tissue layer, with the site dictated by the surgical map. It is common to need more than one surgical stage before the tumour is cleared, and some patients require several. There are thus two main advantages of Mohs surgery. Firstly, the technique spares normal tissue that doesn’t need to be excised, and may be lost ‘unnecessarily’ with a conventional surgical technique. This may well result in a smaller surgical defect, that can be reconstructed with a smaller repair, and achieve a superior cosmetic outcome. Secondly the technique carries a higher cure rate than conventional surgery. Very rarely, the skin cancer cannot be totally removed, and further surgery or radiotherapy may be needed at a later date. In less than 1% of cases, perineural invasion is identified. This means the tumour has invaded the nerves in the area. In this setting, radiotherapy may be required post-operatively. For a number of reasons, the benefits of Mohs surgery are most applicable to tumours on the head and neck, or digits. Mohs surgery is most commonly used for basal cell carcinomas, particularly those of an aggressive subtype such as micronodular, infiltrative and sclerosing types. These types are more likely to have tentacle-like extensions of cancer cells, which track beyond what is clinically apparent when the skin is examined with the eye. The microscope allows visualisation of these extensions. Mohs surgery is also particularly useful in tumours which are ill-defined, previously incompletely excised, or recurrent. How is the surgical defect/hole stitched up? The surgical repair depends on the shape and depth of the defect, which is not known until the microscope slides have confirmed the tumour has been cleared. The repair takes an average of 20-30 minutes, but may often take longer, for larger or more complex defects. Tumours can sometimes prove significantly larger than what is apparent on the skin surface. The large defect that ensues may, of-course, be confronting for patients. The reality is that it is these patients who benefit most from the Mohs surgical technique. It is a big day, however the benefit comes in knowing that the tumour is all out at the end of it, and these patients have avoided what would have otherwise been multiple episodes of surgery if conventional excision had been performed. Once the tumour is cleared, your Mohs surgeon will discuss the surgical repair with you. More local anaesthetic is injected at this time. Small defects may be repaired in a side-to-side fashion. The oval or circular shaped defect is converted to an ellipse shape, with small triangles of tissue removed from each end. Deep absorbable stitches are placed beneath the wound’s surface, and non-dissolving stitches are placed at the wound edges. A graft is a piece of skin taken from elsewhere. Common donor sites include the skin in front of the ear, behind the ear, on the neck or arm. The donor site is stitched closed side-to-side, and the grafted skin is stitched into the defect. Grafts often heal very well; however, they can look a bit like a patch, with the skin of the graft being paler or of a different texture to the surrounding skin. Grafts often take a few weeks to settle in, and can be sloughy/scabby for some weeks as they heal. They may require salt-water bathing or soaks, as well as regular dressing changes, during this period. A flap involves using loose skin from around the defect. The skin may be mobilised using a curve-, A-, T-, or V- shaped piece of skin, which is sewn into the defect. Flaps are more complex to perform than grafts, and often result in more bruising and swelling. There are also more scar-lines than with a graft, or side-to-side closure, but these generally settle in well over time. An advantage of flaps over grafts is that the tissue generally matches in better than with a graft, as it is local skin. Secondary intention healing is where the defect is left to heal by itself. This may be used for shallow defects on the nose, in the bowl of the ear, in the nail, or on the scalp. In the right setting, this option often results in an excellent cosmetic outcome. Healing may take weeks to months, and require regular dressings at home, with intermittent review by your doctor. You will be asked to fast from midnight if you are undergoing joint surgery with a plastic, or oculoplastic surgeon. Other patients should take a light breakfast prior to attending, and food and drink will be made available during the day. Please take your medications as usual, unless otherwise directed. Most blood thinning medicines are continued, but please discuss these with your dermatologist. If you are on Warfarin, your INR should be checked two days prior to surgery, and you should contact Dermatology Specialist Centre if your INR is above 3, as your surgery may need to be deferred. Please use a chlorhexidine-based antibacterial body wash all over (avoiding your eyes) your body the day prior to surgery. This has been proven to reduce your chance of a wound infection following surgery. This can be purchased as ‘2% Microshield’ at most pharmacies. The surgery is performed in an operating theatre at either The Skin and Cancer Foundation, Carlton, or The Avenue Hospital, Windsor. You should not drive yourself after the surgery. Relatives or friends cannot wait with you during the surgery, but will be advised when it time to come to collect you. Mohs surgery is generally a long day. Expect to be at the hospital for at least several hours. 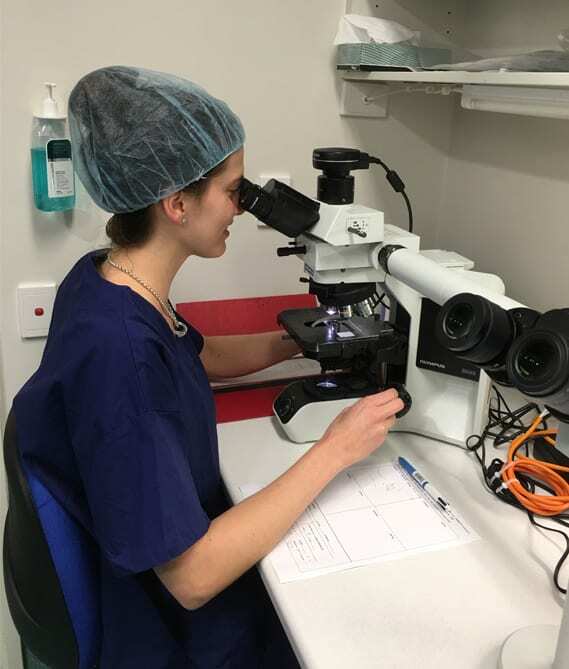 It takes 1-2 hours to make the microscope slides after tissue is excised, so there is a wait between each surgical stage, and before the defect is repaired. You will wait in a recovery area during this time. Bring a good book, or alternative entertainment, with you. You should arrange for at least 2 days off work (the day of treatment, and one day off afterwards), but may need longer, depending on the extent of your surgery. Please request a Medical Certificate in advance, if you need one. Plan to avoid any strenuous activity, that would cause you to sweat, for at least 5-7 days. Avoid swimming for two weeks. Please contact our office before your surgery day if you have any questions. Pain – you will experience some discomfort after your surgery. This is generally easily managed with Paracetamol 1000mg taken as needed, up to four times daily. Your pain should steadily decrease in the 1-2 days after the procedure. Bleeding – if you notice any blood seeping through your dressing, please lie down and apply pressure with clean gauze or tissues and your hand for 20 minutes. You will be given an after-hours number to call if problems persist. If you have issues during the day please call our office, and ask to speak to a member of nursing staff. Swelling and bruising – swelling is common following Mohs surgery, especially around the eyes, and lower cheek/neck area. Swelling may be decreased by sleeping with your head slightly elevated on 1-2 pillows, and by using an ice-pack for short periods during the first 24 hours. Infection – any surgical wound may become infected. You will receive antibiotics whilst in hospital to guard against infection, and may be given a prescription to continue with these at home. If your wound becomes red/sore/warm/tender or oozy, you should contact the office to arrange prompt review. Numbness – surgical sites are often numb, as the small nerve-endings in the skin have been severed or injured during the excision process. This numbness improves over months, but may be permanent. Scarring – all surgery results in a scar, with the aim being to achieve as fine-a-scar as possible. During the healing process, facial scars in particular are often red and bumpy. This is largely due to the inflammation that often forms around the dissolving stitches inside the wound. This settles over the course of approximately 12 weeks. You will be asked to keep your wound taped with a small piece of skin-coloured Micropore tape during this period, as this is evidenced to improve healing. Some scars do, unfortunately, stretch over time, or heal in a thickened fashion. Others develop telangiectasia (broken blood vessels), which is particularly common around the nose. These issues can be addressed with scar revision down the track, which may involve small surgical procedures, steroid injections, or lasers. Your dermatologist may wish to arrange a wound review within 1-2 days. Sutures are typically removed in 5-7 days, depending on the site. You should call for review sooner if you have any concerns regarding your dressing, or wound. A follow-up period of observation for at least five years is essential. Depending on your situation, your dermatologist may recommend that your follow-up occur with themselves, or with your referring doctor, at 6-12 monthly intervals.